EOS Price Analysis: Can EOS Move Back to Top 5? EOS price jumped higher this past week above $8.00 against the US Dollar. EOS/USD is currently correcting lower and it remains supported above $7.80. EOS price surged higher and broke an important resistance near $7.50 (Data feed of Kraken) against the US Dollar. There is a short-term bearish trend line forming with resistance at $8.60 on the hourly chart of the EOS/USD pair. The pair remains well supported on the downside around the $7.80 level. This past week, there were solid gains in EOS as its price moved above the $8.00 and $9.00 levels. More importantly, the cryptocurrency surpassed Litecoin and moved to the fifth position in the market cap. The price topped around the $9.86 level and started a downside correction. It declined below the $9.00 level and settled below the 100 hourly simple moving average. There was also a break below the 38.2% Fib retracement level of the last wave from the $5.89 low to $9.86 high. The chart above suggests a decline in the price, and the market cap dropped and it moved back to the 6th position. It tested a major support area near the $7.80 level and found buyers. The 50% Fib retracement level of the last wave from the $5.89 low to $9.86 high also acted as a strong support. The price is currently recovering, but it is struggling to move above the $8.60 level and the 100 hourly SMA. Additionally, there is a short-term bearish trend line forming with resistance at $8.60 on the hourly chart of the EOS/USD pair. A break and close above the trend line resistance at $8.60 is needed for the price to resume its upside. Above the $8.60 level, the price could attempt to test the $10.00 handle in the near term. On the downside, the $7.80 level holds a lot of importance. 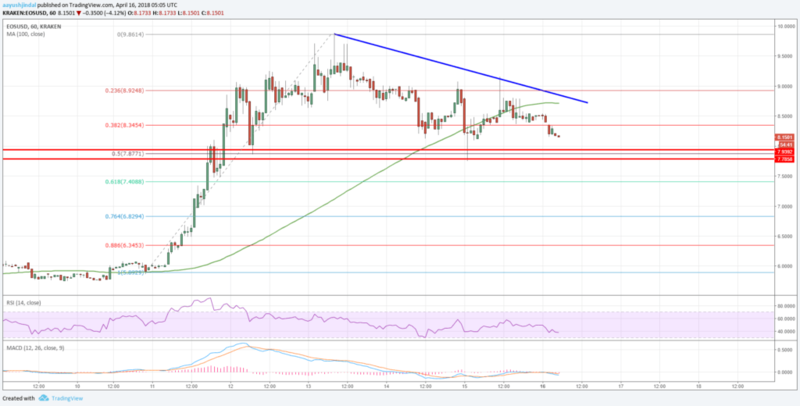 EOS price must hold the stated $7.80 support to avoid further declines. Below $7.80, the price could retest the $7.00 handle.